This May we were lucky enough to spend almost the whole month in one of our favorite domestic escapes, Byron Bay. With more time on our hands than we would usually have (long weekends and the like) we were able to slowly work our way through the local advice and try a few different restaurants (some classic icons, some new to the bay) – these are their stories…cue Law and Order sound effects. LIGHT YEARS First cab off the rank (thanks to local recommendation from my good friend Sarah Lawson) was Light Years. The FB messenger description she gave was “Vietnamese restaurant, delicious food, great cocktails, cool vibe” and boy was she spot on. We ended up returning to this place a total of four times for either the cocktails, the food or the experience itself. TRY: The Hot and Numbing Fish. The Spiked Kombucha cocktail. 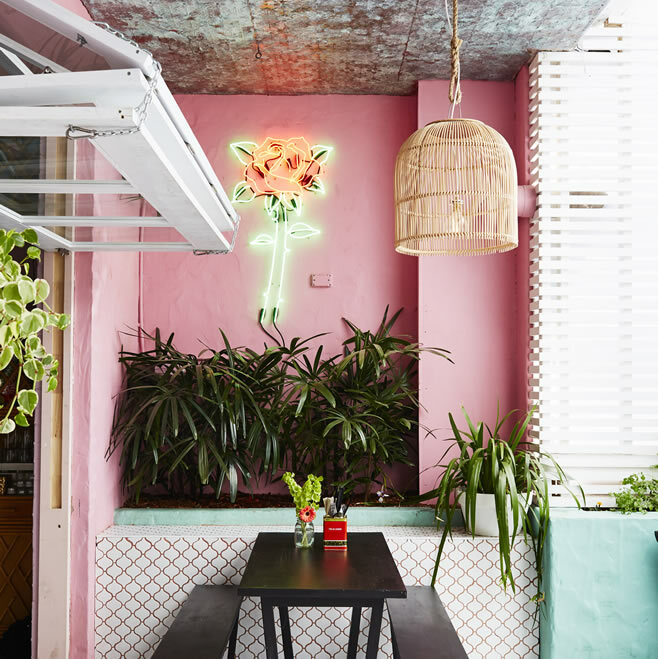 NOTE: Not really the kind of place you’d want to bring kids – more for a date night or group vibe. Go early, get your name on the list and then go to The Beach Hotel for a drink until your table is ready… they’ll call you. IL BUCO was a quick one for us. Bay Lane – in and out early dinner with our almost 2Y daughter. We went to Il Buco because it had been a traditional ‘must do’ in years gone by (and was still recommended by locals)… plus it was approachable and easy for a walk in and quick, authentic Italian service. Pizza was great but we were hoovering it down – I’d say this is perfectly placed as your hangover night not your main play night. 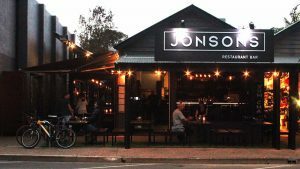 JONSONS – Well thank you Jonsons for bringing a delightful new restaurant experience to the Byron Bay to do list! We went for dinner with local friends Matt & Christina and were totally impressed by the menu, food itself, cocktails, service and ambiance. Booths are fantastic. We felt as though we could have been anywhere in the world. I couldn’t get a picture of the food as it was a bit dark and honestly we were just having too much fun. Can’t wait to get back there. TRY: Seafood risotto (served authentically on a flat plate so as not to overcook the risotto rice). RAE’S ON WATEGOS was always going to be on the list for at least a few visits on this trip… in my Google Maps review I called Rae’s the jewel in the crown of Wategos. 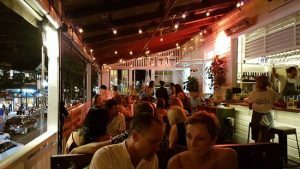 Probably the main thing to mention here is the freshen-up the establishment has undergone, a crisp (linen) interior update coupled with a more approachable and friendly experience with staff paved the way for a refreshing menu selection that didn’t disappoint. Go for the view, stay for the way it makes you feel (sing it!) – there’s no place quite like it. 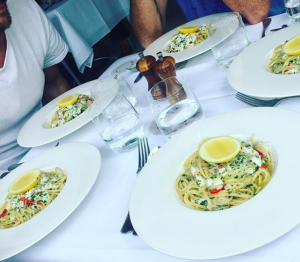 TRY: The Spanner Crab and Chilli Linguini (been on the menu since day #1 I believe). Oh and Oysters. Oh and Cured Kingfish. NOTE: You can and should book. Make sure you arrive before sunset (also a great lunch location for this reason). We took our almost 2YO daughter a couple of times and it’s fine with kids, bright, open, friendly. MISS MARGARITA is a restaurant I’d been to before for nachos, burritos, cocktails and fun vibes. 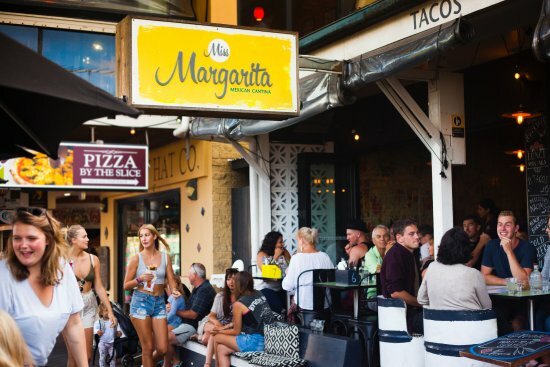 With a location opposite The Beach Hotel and on the corner near the actual beach, Miss Margarita is kind of set for success – but they don’t rest on their laurels. On this trip we went there twice, and one of my favourite visits was for a late night snack with my sister post-pub. Nachos could use a little extra cheese so don’t be shy in asking. NB: No bookings, get there early. Kid friendly (but most of the adult dishes are pretty spicy so stick to the kids menu). ELIXIBA came to my attention when my partner came running back to the car telling me how excited I would be about this plant based restaurant. Elixiba is self described as having a “fresh menu made from scratch with wholefood ingredients including the Best hand cut, spiced chips in the shire. Exclusive craft beer, herbal cocktails, and elixirs.” Enough of that, it’s all about the Honourable Nachos (best seller). Go here for the food when you’re hungry, not necessarily for your night out on the town. Kid friendly. NB: Don’t be fooled by the eclectic branding (that makes this look more like a ride at Disneyland than a restaurant) – go for the food. BEACH BYRON BAY RESTAURANT is a classic. Possibly one of the best-positioned restaurants in the country, you literally feel you’re floating on water. 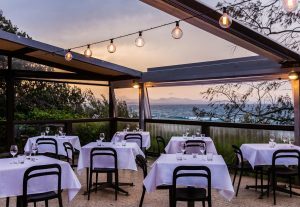 This trip we went to Beach Byron Bay for breakfast (twice) and a special dinner. Being that it’s almost all about the view – you’ll want to get there before sunset so take that into your consideration (or perhaps go for lunch). I say almost all because this trip saw the food at Beach Byron Bay lift its game. We hear there’s a new chef in town and wow – we could tell. The quality of the food now matches the view. Some wait staff still seem to be learning some ropes but to us that just meant they checked in more often and weren’t arrogant about the place. TRY: The King Prawn Entrée. Taste sensation. Quite kid friendly for breakfast and lunch but perhaps consider other restaurants for dinner with kids (not because they weren’t great with our little one, just because it’s quite a fine dining experience). THE BALCONY BAR AND OYSTER CO has come a long way in the last couple of years. 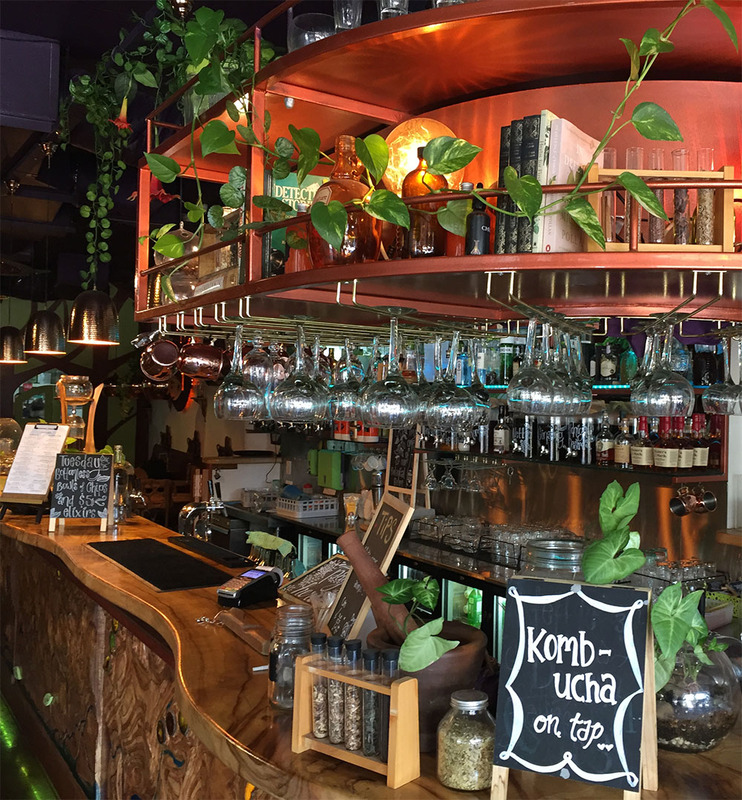 What used to be a tapas menu is now updated to a full, well thought out delightful options. At the time of this review they were offering $1 oysters on Wednesday’s from 5-6pm. I ate 36! The Balcony is still a must-do restaurant on any Byron trip in my opinion. Seems like they’re well set to cater for groups for wedding wash-ups too – plus a nice private dining room. Book the couches on the balcony for 8 people if you can. Heaps of kids there every time we go. THE ROADHOUSE was a funny one. I loved it but it made me nervous. The Pizza at The Roady was hands-down some of the greatest I’ve had in years. Honestly amazing. Service was hit and miss, some staff were just lovely and uber-helpful while others were a little too cool for school. Some locals coined this place “The Rudehouse” but I think that’s going a little far. Though I get a sense they’d rather be off my review lift for some reason – they seem to prefer to achieve their culinary excellence quietly. Having said that, I don’t need to be pointed out that there are already water glasses on the table when I ask for a glass for my beer… if you don’t have beer glasses you can just say so and we have the same outcome without me feeling like a loser *vent over*… now back to the Pizza. I can see why this place is packed with a line out the door from 5.30pm. Definitely give it a try, any misgivings on waiting for a table will be forgiven by your taste-buds. NB: No bookings. 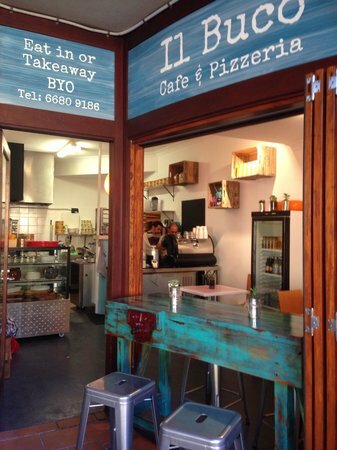 The pizza restaurant is actually a new addition next to the café/restaurant that you’ll find online. So the pizza restaurant is a bit of a mystery (and they like it that way). Prob not one for the kids (let those taste buds develop to a point they can appreciate this amazingness). TASTE OF MELAKA is last but not least thanks to a recommendation form our local friends Tara and James. Authentic Malaysian. Best Roti I’ve had in years. 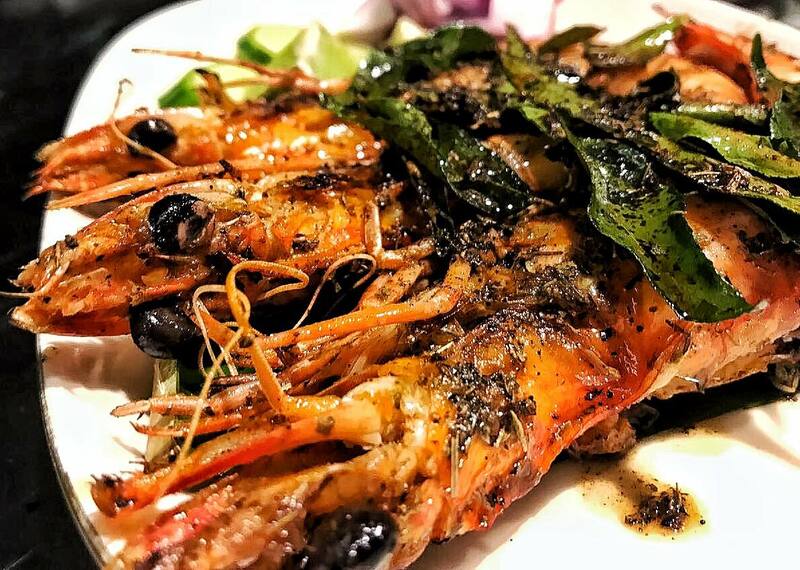 Sambal prawns to die for. Melaka open from 5.30pm and are full house by 5.45 and the food is why. Incredible deep flavours. Make sure you’re really hungry so you can appreciate it. Not super cheap (as you may expect from the fit-out, without being rude – it just looks unassuming). TRY: Everything and let me know your favourite for when I go back. Kids are fine here but it’s pretty dark and moody. Special Mention to DUK on Bay Lane, the only place that was recommended by almost every local (but we couldn’t quite get to). Fave Breakfast Shout outs to Bayleaf, Combi Byron, Leaf & Grain. Lunch must do’s are Doma in Federal, The Farm @ Byron. Posted in All or Nothing, Raving reviews.